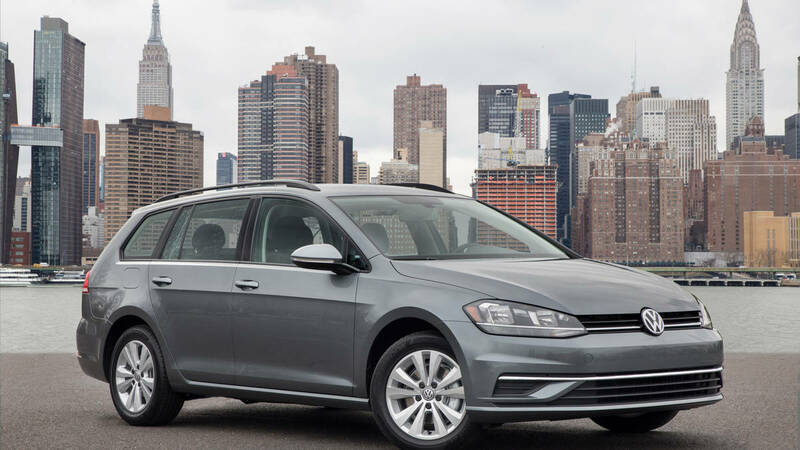 The 2018 Volkswagen Golf Sportwagen Review: Volkswagen has offered various Sportwagens over the years, but they were Jettas. Now the compact wagon is based on the new Golf, so it shares a lot of goodness with the worldwide best selling hatchback. The company bills the Sportwagen as an alternative to a compact crossover, because it delivers the hauling space, but is a better handling car than an SUV. You enjoy roomy passenger accommodations and 30.4 cubic feet of cargo room behind the second row or 66.5 cubic feet when the seat is folded flat. You may not sit as high as in a crossover, but it’s more fun to drive. You enjoy brisk performance from the turbocharged, direct-injection 1.8-liter inline 4’s 170-horsepower and 199 foot-pounds of torque. If you order a manual transmission (and you can! ), torque drops to 184, but you feel more in control. My Platinum Gray Metallic test car came with the six-speed manual transmission, which is offered on selected versions of the Sportwagen. It was the lowest level S model, with 4Motion all-wheel drive, but it didn’t feel cheap. It did lack a few creature comforts, such as keyless entry or pushbutton start, two standard features on most cars today. The other two levels, SE and SEL, offer additional features. The SE gets keyless entry and pushbutton start lacking in the S, for example. The SEL model has navigation, Climatronic automatic dual-zone climate control, ambient lighting, and sportier seats. You can even get Fender Premium Audio. The VW Car-Net App-Connect smartphone integration is a big selling point of Sportwagens. The SE and SEL get a more robust version of the system, which is meant to make the car more connected and intelligent. The App-Connect module is on all Sportwagens, and lets you run selected smartphone apps on the car’s display, including Apple CarPlay (which I used a lot) and Android Auto (if you have an Android phone). VW Car-Net Security & Service, on SE and SEL models, includes a six-month trial for Verizon Telematics, and offers Automatic Crash Notification, dial-up customer assistance, roadside assistance, and Stolen Vehicle Location Assistance. You can lock and unlock doors remotely. The Family Guardian warns you remotely if the car is speeding or has left a designated area. There’ll really be no Fun Fun Fun when daddy knows you aren’t behaving yourself. I enjoyed selecting my own gears, even in commuter traffic. The shifter delivers a solid, connected feel, and you sense the gears meshing below your hand. The clutch has a nice take up and the power is laid down easily. I did notice that of the six buttons surrounding the transmission base in my S model, only one had a label, while the other 5 were blank. The SEL surely fills those spots. The engine is rated at 24 City, 33 Highway, and 28 Combined. I averaged 26.6 mpg during my test week. The Greenhouse Gas emissions are 6, and the EPA Smog number is still being calculated. 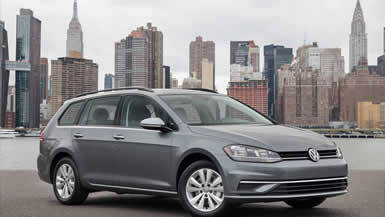 VW moved to the People First Warranty recently, with its six-year or 72,000-mile limited “bumper to bumper” coverage. With this action, VW now beats other car companies’ similar warranties. One way that VW differentiates between models is by wheel. The standard S gets 15-inch “Lyon” alloys, while the 4Motion moves up to 16-inch “Toronto” rims. The Top SEL gets 17-inch “Karlskoga” designs. They sound exciting. Pricing starts at just $22,735 for the S model with front-wheel drive and five-speed manual. You can add an automatic for $1,100 additional. My tester, an S with 4Motion all-wheel drive, came to $24,785. The SE base stickers at $28,170, while the top SLE model retails for $31,095. All prices included destination charge. What might be a fascinating (and unique) offering is an all-electric Sportwagen based on the new e-Golf. Now that’s something I could really get excited about. The Bottom Line: The 2018 Volkswagen Golf Sportwagen is more fun to drive than your standard crossover, with legendary Golf driving pleasure and an attractive and functional interior. The Golf has won numerous awards, and when you drive one, you can see why. The original 1975 Golf was pretty plain looking and basic, reflecting the times, and the car’s important role in shifting VW to new front-engine, water-cooled vehicles. Today’s Golf is a leader in delivering a high-quality experience in the cabin. There’s heated seats, even on this lowest model. The interior features a variety of good-looking and durable appearing surfaces, and even in base trim has a sense of style and comfort. And maybe, just for those reasons alone, you should “Drive one, Buy one, Today ©”.